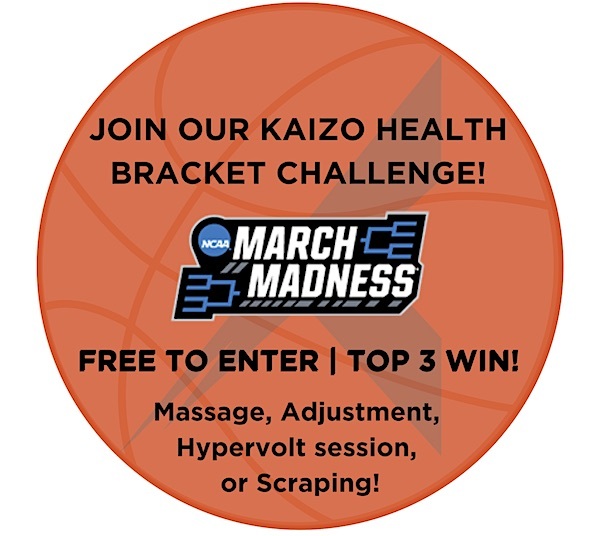 MARCH MADNESS at Kaizo Health! We are giving away some pretty awesome prizes to the TOP 3 WINNERS at Kaizo Health. Let the games begin! WINNER: 60-minute Massage OR Free Full Visit with the Doctor! 2nd Place: 45-minute Massage OR Scraping Session! 3rd Place: 30-minute Massage OR Hypervolt Session! Entry is FREE and open to everyone! Download the App and submit your bracket by March 21!